My husband Doug and I met in 1980 as students at the University of Colorado. I first laid eyes on him when he was shoveling manure out of the trunk of his car. He turned me on to compost, Organic Gardening magazine, food co-ops and Wendell Berry. Together we dreamed of farming. In 1994 we discovered 16 acres in the heart of Dry Creek Valley, just outside Healdsburg. When we bought the land, the fields were planted to hay, the perfect tabula rasa for creating our vision of a diversified farm. We moved here from San Francisco with our two young sons in 1998 to build a home and grow our farm. HomeFarm is small; our farming is sustainable. We use organic and biodynamic farming methods. Today the arable fields comprise about 11 acres and the other 5 acres lie alongside Dry Creek and Crane Creek. The creekside acreage is native riparian habitat that we enhance and protect for the benefit of fish and wildlife. Beehives dot the orchards. 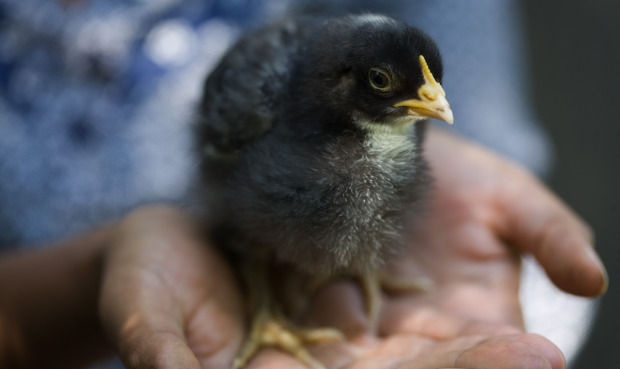 Free range chickens walk the beat – patrolling for bugs, fertilizing the land, and supplying us with rich, healthy eggs. Last week we received 100 day-old chicks, 8 different breeds. Among them are Brahmas and Cochins: rare, old farmyard breeds that are in danger of extinction. When SHED opens later this year, the café, larder, and produce section will offer food fresh from HomeFarm. The pantry will feature delicious preserves prepared from our fruit. The wine bar will pour wine made with our grapes. Sustainably grown food from other local farms will complete our offerings for breakfast and lunch in the café, and take-out food for enjoyment at home or on a picnic. This entry was posted in Farming, Foodshed, HomeFarm. Checked out your website and pictures and absolutely love what you have created in the “backwoods” of Healdsburg. Mazeltov! we will be visiting with Jane and Evan at the HomeFarm in early July and hope to catchup and chat with you then. Sarah & I wish you the best: a true case of Leading by example. Congratulations! We are looking forward to the addition of The Shed to town. This is so exciting! I have been watching the building go up and wondering what it’s all about. Now I know…good for you and good for the community! I have been living in West Sonoma County for the past year and there is a huge sustainable & organic farming movement here. What your are creating could be the start of something big and wonderful. I helped Barbara from Country Daisy/Uniquely Chic transform her business into what it is today. I would love to get involved with your venture some how. Good luck…can’t wait til it opens!!! I was just up for a visit to Healdsburg and popped into Shed. I saw the most amazing anise hyssop for sale and I am curious which farm supplies you with this? The employee said it might be the Shed’s farm, is this HomeFarm? I am starting a tea company that is focusing on herbal tisanes and am gathering a list of farms that might be interested in growing specific herbs for us. I live in San Francisco and will be working primarily with farms in the bay area. Any information about your source for herbs would be truly appreciated. I love what you have created at the Shed, it is truly an inspiring space. We’re so glad you enjoy SHED- thanks for letting us know! The anise hyssop is grown on HomeFarm, our SHED farm in Dry Creek Valley. We’d be happy to consider growing it for you- we too love it for tisanes! Please write us at be@healdsburgshed.com if you want to discuss. Best of luck in your new venture. Perhaps we can carry your teas once you’re in production!